All good things don’t have to end. The American Boat & Yacht Council (ABYC), which has hosted the Westlawn Institute of Marine Technology since 2003, recently announced that the long-distance learning school would have to find a new home. John Adey, president of ABYC, cited the school’s inability to cover its costs, resulting in financial burden to ABYC. The boating industry, domestic and international, should be alarmed. According to director Dave Gerr, since its founding in 1930, the non-profit institution has trained more practicing boat designers than any other school in the world. Many design offices and boatbuilders would be hard pressed to find adequately trained help to fill their employment needs. More than 45% of Westlawn students live outside the U.S. Enrollment at any given time averages between 130 and 160 students. Chairman of the Board of Directors Robert F. MacNeill, former president of Carver Boats, and a longtime industry veteran with Chris-Craft, Viking, Four Winns, and OMC, is seeking a buyer who will perpetuate the rich legacy of Westlawn. Meanwhile, he estimates the school will require about $140,000 a year to continue operations. The most popular curriculum is the four-year Yacht & Boat Design Program; average study time is 3,300 hours. In addition, the school offers short continuing-education courses: Elements of Technical Design, Metal Corrosion in Boats, Fuel Systems in Boats, Interior Design Concepts for Boat Design and the Boatbuilding Industry, Fiberglass Boatbuilding Materials and Methods, and Production Boatbuilding Methods. 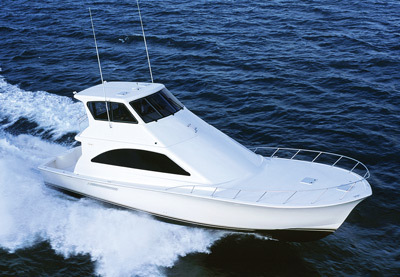 Westlawn graduate Dave Martin designed this 62′ (18.9m) sportfisherman for Ocean Yachts in Egg Harbor City, New Jersey. He was profiled in Professional BoatBuilder No. 103. The list of notable alumni is impressive: Jack Hargrave, Tom Fexas, Ted Brewer, Dave Martin, Rod Johnstone, Bruce King, Gary Mull, Bill Shaw, Charlie Morgan, Royal Lowell, Bill Cook, Rodger Martin—to name a few. This group is responsible for launching thousands of boats—literally! 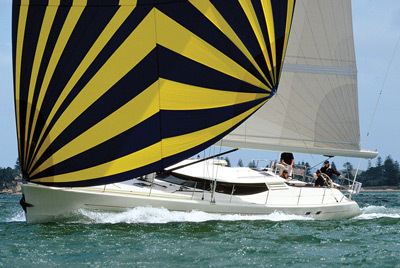 Kevin Dibley, also a Westlawn alumnus, designed the Commander 66′ (20m) Performance Cruising Yacht for Commander Yachts (KZ Marine, Auckland, New Zealand). In addition to Gerr, Westlawn staff includes Dean of Naval Architecture Gordon G. Piché, Provost Norman Nudelman, Instructors Walter Wales and Eric Holohan, and Student Services Coordinator Mary Ann Gesner. Westlawn, a 501(c)3, is accredited by the Distance Education and Training Council (DETC), and the Royal Institution of Naval Architects (RINA). It boasts an 81% completion rate, and 100% of students surveyed said they achieved their learning goals. Nearly all types of boats under 200′ (61m) are included in the curriculum: motoryachts, powerboats, sailboats, multihulls, commercial and fishing boats, passenger ferries, and research vessels. Materials include fiberglass/composite engineering and construction, metal-boat engineering and construction, and wooden-boat engineering and construction. One can keep up with the school’s activities, alumni doings, and learn something from technical articles published in the online technical journal The Masthead. As a longtime writer and editor in the boating industry, and a graduate of Westlawn’s Elements program, I urge you to contact Dave Gerr at dgerr@nullwestlawn.edu to learn how you can help keep this important institution afloat. If you wait to read more in some other publication, it may be too late. Westlawn Institute of Marine Technology, c/o Maine Maritime Museum, 243 Washington St., Bath, Maine 04530, tel. 800–832–7430, 207–747–0088, fax 207–747–0084, website www.westlawn.edu, e-mail info@nullwestlawn.edu.